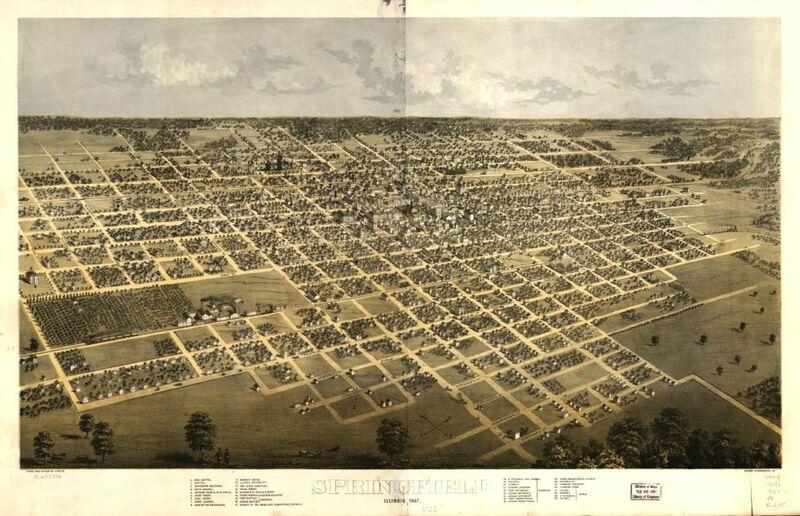 Although not to scale, the 1867 bird’s-eye view of Springfield drawn by A. Ruger for the Chicago Lithographing Co. is considered accurate in its placement and depiction of city buildings and streets. Note that the map is oriented with north to the right. Albert Ruger (1828-99) was an important figure in post-Civil War urban mapmaking, producing more than 250 such lithographs from 1866 into the 1890s. “His numerous views of midwestern cities provide us with clear and useful images of towns and cities of that region in the first decade after the Civil War,” wrote John W. Reps in Views and Viewmakers of Urban America: Lithographs of Towns and Cities in the United States and Canada, Notes on the Artists and Publishers, and a Union Catalog of Their Work, 1825-1925 (1984) “… His views are well drawn and from a sufficiently high perspective to display fully the street patterns and other major elements of the places depicted. Map source: Library of Congress; a zoomable version is available from Dickson College. And a full-size paper version of the Ruger map is on display in the Sangamon Valley Collection at Lincoln Library, Seventh Street and Capitol Avenue. Recommended: Although the reader can expand this map (click on the graphic and then click on the ‘plus’ symbol), this remains a compressed version. The map is in far better detail at the Library of Congress site. This entry was posted in Buildings, Churches, Maps, Railroads and tagged Arsenal, Executive Mansion, Home of the Friendless, Illinois State University, Lincoln Home, Lincoln Tomb, Market House, Oak Ridge Cemetery, Statehouse. Bookmark the permalink.